December, 1966: Platoon leader Lt. Joseph Callaway had just turned twenty-three when he arrived in Vietnam to lead forty-two untested men into battle against some of the toughest, most experienced, and best-trained guerrilla soldiers in the world. Callaway soon learned that most events in this savage jungle war were beyond his control. But there was one thing he could do well: take the best damn care of his troops he knew how. In the Viet Cong–infested provinces around the Mekong Delta where the platoon was assigned, the enemy was always ready to attack at the first sign of weakness. And when the jungle suddenly erupted in the chaos of battle, the platoon leader was the Cong’s first target. 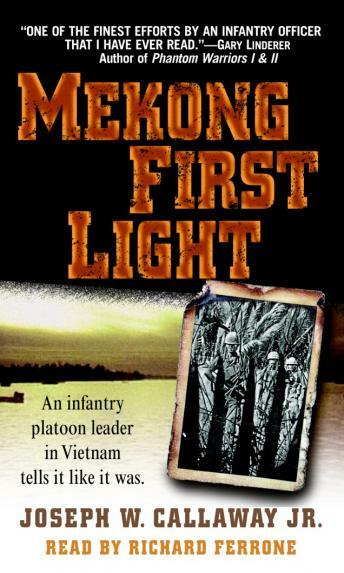 Mekong First Light is at times horrific, heartrending, and heroic, but is always brutally honest. Callaway’s account chronicles a soldier’s painful realization of the true nature of America’s war in Vietnam: It was a war that could not be won.